That headline makes a bold statement, but I think I can stand by it. 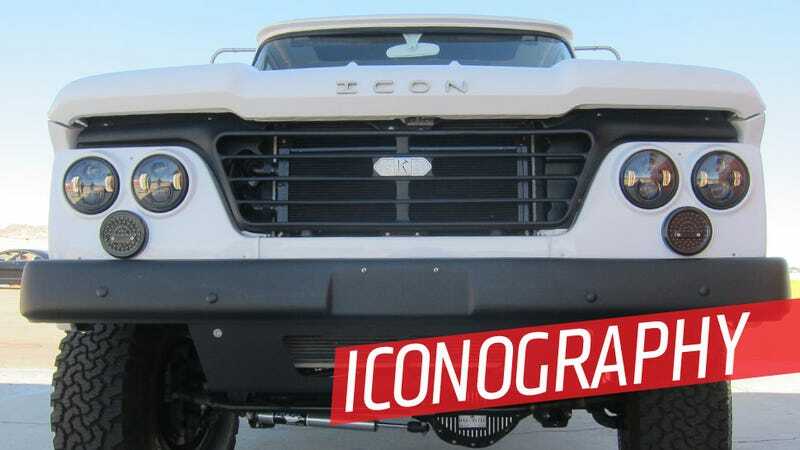 Icon is building (or, really, re-building) the world's best SUVs. They're expensive as hell, sure, and they're not the most luxurious or advanced or anything like that. They're simply made better than almost anything I've ever seen. In case anyone's not familiar with Icon, they're best known for re-making old Toyota Land Cruisers into new old Toyota Land Cruisers. The basic design is kept, but the whole vehicle is torn down and rebuilt and modernized from the inside out. Modern engines, electronics, interiors, everything are installed on an entirely stripped, rebuilt and reworked platform. Everything is built to an incredibly high specification, and the results are remarkable, but only to people who are really looking at the cars. They do the same basic thing with old Ford Broncos and very early Jeep CJ-3s. Also, Icon has a line of cars they call "Derelicts" which involve taking old, rough cars and rebuilding and updating them mechanically and electronically, while maintaining much of the look and patina of the car in its semi-decrepit state. Everything Icon makes is expensive enough that I may as well give up ever owning one right now if I know what's good for me. Before I went by to check out Icon's LA-area factory, I wasn't really sure how much of this cost was just status-money and how much actually meant something. I'm happy to say that what I saw suggested that these things are so expensive because each and every little part is produced the best possible way. Which still means I can never grow enough sellable kidneys to afford one. Visting Icon's LA factory was a treat. It's halfway between a factory and a very large workshop, and the whole parking lot in front is stocked with donor stock Land Cruisers, Broncos, and soon-to-be-derelictized old, interesting cars. Inside, I got to sit down with Jonathan Ward, founder and chief designer at Icon, and talk to him about why he founded the company, what he wants to do with it, and, more importantly, pitch him ideas for other cars to give the Icon treatment to. Incredibly, he and I had the exact same idea for one of these. That's the first time anyone in the business of making cars has totally agreed with one of my inane ideas. Jonathan Ward (the man behind Icon) had one of the best car-geek offices I've ever been allowed in. He even had this amazing vintage Beetle bar set that I shamefully considered stealing. This insanely detailed and functional technicians' instruction model from a German bus company was a marvel as well. I first met Jonathan at the AMG event, and we hit it off because of a shared love of Raymond Loewy's work. This cabinet was designed by Raymond Loewy, and it and that clock were both salvaged from a famous Valley Cadillac dealership. Ward has also been experimenting with some photo prints exotically emulsified or something onto billet aluminum panels. They're pretty incredible. Why didn't 1940s Dodge build this amazing thing? There's a number of cars awaiting comprehensive Iconization, including this incredibly handsome old Chrysler. I got 32% classier just standing next to it. You know that amazing Power Wagon Icon made? It's getting a brother. Just a nice shot of a Bronco being finished. Icon will rework all sorts of things, including this Land Rover, which Jonathan didn't have very nice things to say about, construction-wise. Let's just say the British were very good at ignoring how differing metals interact. Also, note that all the plastic bits that made up the grille and headlight surrounds are being replaced with custom-milled aluminum replacements. A finished Icon FJ and more derelicts awaiting exciting things. More future inventory in the parking lot. A completed Derelict. This one boasts all-new and modernized everything in a delicious, tatty shell. That means all those vintage switches have been rebuilt to activate modern solid-state electronics, and each of those gauge needles are microprocessor-controlled. But they look just like they did 60 years ago. And, that's a new Coyote engine crammed in there, with a custom-made radiator, custom frame work, modern brakes, and on and on. It's pretty incredible.